Any fintech project seemed top of the line a decade ago, but now the companies that do not adopt advanced technologies are slowly becoming obsolete. The ability to transfer money globally is no longer the main selling point - those transactions have to cost less, work faster and preferably offer some solid proofs of being complete (security). The demands of the market rise sharply, and a lower entry threshold for new fintech startups makes it much harder to withstand the competition for any business on the market. The only way to the top is to innovate. And the innovation requires using the best technologies that are currently available and possibly improving them further. The market is still now unsure about how to utilize all the tech and how to solve pressing issues with it. The blockchain is one of those technologies that people actively discuss, but the use cases are no match to the talks in numbers. And we believe that this can be used to solidify the advantage over the competition and push for higher ground. 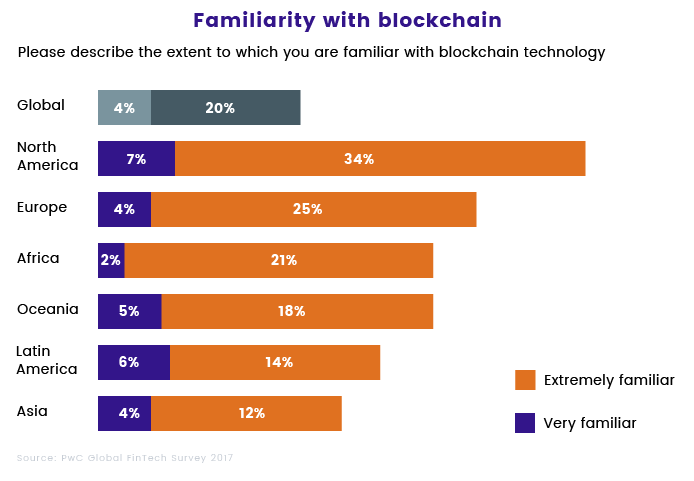 The PwC fintech survey shows that familiarity with blockchain is rising globally, making it even safer for a fintech business to use the tech and advertise it to the potential customers. The survey is more than promising, as its results suggest that a startup can implement blockchain and expect the customers to know how to use it and why is it for the best. All right, the fintech is slowly adopting advanced technologies, including the blockchain. The pace of change, however, still allows outplaying the market opponents with a correct implementation of newer tech. The blockchain offers a set of major improvements to the user experience, especially in fintech. Its structure, work patterns and potential unlock multiple ways to start doing better than your regular competitor. The following list is as diverse as possible to cover as many issues and niches as possible. If you feel like more advice and assistance needed for your specific circumstances - don’t hesitate to contact us straight away. To kick things off, let's bust some significant myths about decentralization. It is not all about being independent of the government or another overseeing entity. Decentralization is more about the rules that are set by the community (users, developers, entrepreneurs), than by someone that’s in charge. Consider this a form of online democracy, which offers much more transparency than the alternatives. Just like Wikipedia thrived over centralized competition years ago, the startups can benefit from the decentralization. If you’re trying to attract open-minded people that are willing to create, build, start a business (if your startup is a platform, for example), the fact that the rules of the game are shaped by community and won’t shift overnight will make your project much more attractive. The DAO gave the power to the communities through crowdfunding. The more people contributed - the more important their vote was concerning the area to spend the funds. The rest is history, but these guys taught the whole industry a big lesson. A place where everyone is friendly, smiley and says hello to the neighbors each morning has that little smell of a utopia. But you don't have to go that far. Creating a means of secure and fast global payments will do just fine. The blockchain is capable of storing all data about transactions and protect it, eliminating the threat of post-factum cancellation and fraud. Smart contracts automate the deals and payments, acting as an independent, automated overseeing entity without ways to control it. The clients can benefit from the security due to every bit of information is recorded and protected, and every contract is enforced according to the clauses inside it. The banking industry is losing 5% of the revenue each year to fraudulent activities. Lack of security, low awareness among the client base and other reasons force the financial industry to respond. More authentication, more verification, and double-checking. The most advanced new profile checks (credit history, frauds, etc.) may take up to 50 days, and that is unforgiving to people who are conducting business and depend on a particular transaction to be made. These are KYC and AML protocols, to be precise. Blockchain offers a way out of this one as well. The tech allows storing the history of each identity, its credit scores, financial reputation and sharing the required data securely. The users with such digital "signature" can be trusted or distrusted instantly, based on their digital identity, and that's something that can be used to provide a high level of security from frauds while not delaying the business of people who are only new to the bank. Digital identity makes life simpler for the clients as well due to a life free of constant reviews and screening procedures (those that are visible to the human eye). It also makes verification simple. Whether it is a log-in on the service or digital confirmation of transaction: blockchain can tell whether the activity is malicious or not and proceed according to that. The race for trustworthiness and safety (and there's no blaming them) made banks miss out on billions of people that never, or occasionally used the services of the industry. Screening is an extensive process that may often deny people with lacking credit history the financial aid they need. They might have paid it back, they would have never gone rogue - but the banks still can't find enough proof to trust these people. And therefore miss $380 billion annually. Blockchain allows more data to be analyzed and a more precise screening result eventually. This can help fintech include more clients in the industry and generate a bigger profit while providing better service. Accenture predicts that banks will be able to save up to $20 billion by 2022 if they adopt blockchain. The growth tendencies suggest that the volume of transactions will increase and it will be much harder to track, approve, protect and process for statistical information and other analytical data. Blockchain can offer a solution to the issue of ever-increasing volumes of information like financial records, credit history and more. The ledger system can bring decentralization into the industry and allow secure management and analysis of the information that will only get bigger. Proper management will cut the operational costs, provide better forecast results and allow to spot issues or areas that need improvement much faster. The experts believe that traditional banking and, later, traditional fintech will lose to rapidly growing blockchain-based financial solutions market. We think that this may be the time to use the power of blockchain. Whether it be the security, asset management, identity verification or anything else - this technology can give one an upper hand. Wish to learn more about how to implement blockchain into your fintech project? Let us know contactus@inveritasoft.com, and we'll help straight away!